With Chicago, the “Second City” of the United States – behind New York and behind Los Angeles – it has many opportunities for continuing education in online marketing. As part of our directory of SEO (Search Engine Optimization), social media marketing, and marketing (generally) opportunities for adult learners, here are our selections for continuing education in marketing in the Chicago area. Please note that we can provide corporate training on these topics by custom quote (minimum of 5 participants). Free Directory. Use this free directory of Chicago, continuing education programs in marketing to find possible SEO, Social Media Marketing, and/or AdWords training classes. Be advised that all programs and schedules are subject to change without notice; the JM Internet Group assumes no responsibility for listings in this free directory. Small business owners and marketers, entrepreneurs starting their own businesses, and even non-profits can (and should) avail themselves of free Internet marketing opportunities ranging from Google / Bing optimization to Facebook or Twitter marketing to simple tactics to use “real world” marketing to improve their performance. We at the JM Internet Group are all about learning and doing… If you know of a continuing education opportunity in the Memphis area, please contact us for free inclusion (non-profit organizations, only)! Continuing Education in (Internet) Marketing: Chicago. b/t Harper Ave & Lake Park Ave in Hyde Park. Providing training since 1991, the Computer Resource Center is located in the Hyde Park neighborhood on the near South Side of Chicago. It offers full-day computer classes in the most popular software programs, including Microsoft Office (Word, Excel, PowerPoint, Access, and Outlook) as well as Adobe Creative Suite (Photoshop, Illustrator, InDesign, Acrobat, and Dreamweaver). CRC also provides one-on-one instruction and specialized group training upon request. Courses are offered once a month. Level 1 courses (basic to intermediate) are usually held at the beginning of the month, and Level 2 (intermediate to advanced) are held toward the end of the month. Each course lasts 6 hours, from 9:30 until 4:30. Chicago is clear across the United States from our location in San Jose, California. With plane fares estimated at $500 round-trip, plus workshop time of 8 hours and 1/2 hour of preparation time for each hour of instruction… assuming you have a group of at least 5 persons, an in-person, private workshop training in SEO / Social Media / and/or AdWords would run roughly $1000 plus expenses. So your options are to either use the continuing education resources listed above (be sure to check their course catalogs for course offerings, as these vary over time), to use online training, or to contact us for a private workshop. We also provide one-on-one training online. Here are some fun facts about Chicago: The city was incorporated in 1837. Today it has over 200 theaters, almost the same number of art galleries, and more than 4,700 restaurants, so there is no shortage of places to eat. There are 552 parks, and 26 miles of lakefront. 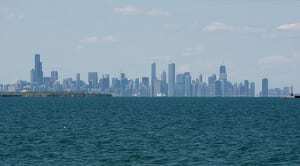 Chicago’s nicknames include The Windy City, The City That Works, The Second City, and The City Of Big Shoulders. Every year, on St Patrick’s Day – March 17th – the Chicago River is dyed green in celebration. The world’s first skyscraper was built in Chicago in 1885 for the Home Insurance Company. The first splitting of the atom, which led to the A-bomb and nuclear power, took place under the football stands of Staggs Field at the University of Chicago. The word “jazz” was first coined in Chicago in 1914. Musicians who lived in the city include drummer Gene Krupa, and bandleader Benny Goodman. Chicago is also the home of US President Barack Obama. This entry was posted in Directory and tagged Chicago, Directory, Illinois on February 20, 2015 by James Smith.